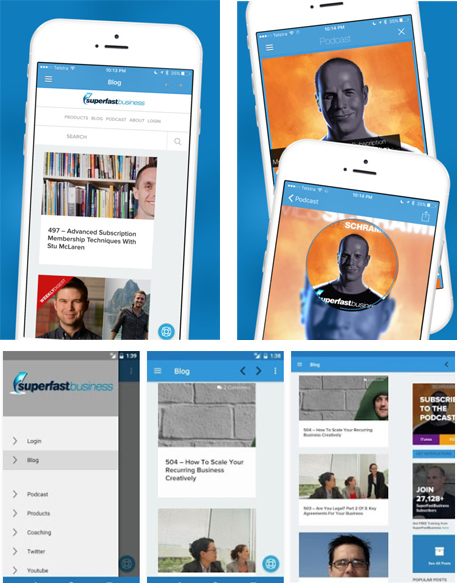 SuperFastBusiness now has an app! 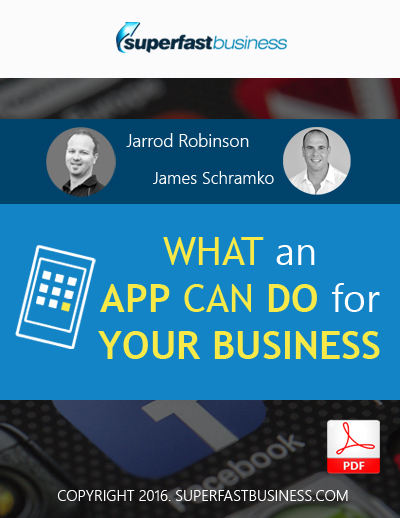 James Schramko chats with PE Geek and app developer Jarrod Robinson about the ideas behind its creation, the benefits in numbers, and what having an app can possibly do for your business. 16:50 – Where do you start? 24:53 – Why hire a developer? Jarrod: Thanks for having me James. It’s always a pleasure to have a chance to chat. James: Now we’ve spoken many times. You’ve brought a lot of value to our community. You’ve shared with them some of the things you’ve been doing with automated webinars in our previous series, we had a multi-part series, you spoke at SuperFastBusiness Live this year, and we’re recording this in 2016. You spoke about some of the things you changed to really improve your business. I get the pleasure of working with you behind the scenes, talking to you about business stuff, helping you grow your business. I know you just came back from a big live event that you ran, which was very successful. Congratulations. James: What we’re talking about today of course is apps. We’re specifically talking about matching an app for your existing audience. We’ll have to sort of break this down a bit, but people who are following SuperFastBusiness will know that I recently launched an app for SuperFastBusiness. I got to say Jarrod, I was a little bit skeptical about it because it wasn’t my first app. When you were helping me with this, you would have seen there were a couple of other apps in my account. I’ve been down the path before. The last time, it was kind of difficult. I had an idea for an app that I was using with coaching clients. One was called Leverage, the other was called Wealthification. It was a bit of a trial to get people to develop it for me. They were already my second and third app. There was actually one before. My first blog, Internet Marketing Speed, had an app. Back then, some company created an app that was really just pulling in my blog and a few media things. It was OK, but it sort of invariably went out of date, and then I changed my domain. So it sort of dropped off the face of the planet. But with the Wealthification and Leverage one, I hired someone to do it inhouse. They were kind of a flighty programmer and they ended up leaving. I don’t know where the source code is, and they’re getting out of date too. So I wasn’t that excited about my fourth app. I’ve seen other people do apps. But we’ve been talking about your app experience, and I’ve seen how prolific you are with apps. How many apps have you made so far? Jarrod: Well, I mean it would be around 100-plus mark for both Android and iOs. I’m sitting here saying that I have no idea how to program any of the languages but have been able to produce that many. It seems pretty crazy, but it’s possible for sure. I think the key is that you find a way to position something that’s useful for your audience. That’s what I have sort of done over and over again. James: So I’m curious to find out how you got started with the app thing. I’ve just given you the rundown of how I got started. By the way, the punchline with my situation is the fourth app, the SuperFastBusiness app, has had a profoundly different impact than the first three. And I give it away for free. Jarrod: I’d say that’s good. James: Yeah. It is great. Let’s look at the stats here. Thirty percent more sessions to my SuperFastBusiness membership forum, which is the primary purpose for me making this app and the primary differentiator from the original app that I made. Twenty percent more users are coming in to the community than before I had the app, and 30 percent more page views. Not only that, they’re staying longer, and they stick around more when they first log in. But I’ve been able to transcend the issue of my users having to log on to a browser on their phone. Now, they can just click on the icon that’s always staring them in the face, the very vibrant orange logo. It works on iPhones and iPads, and now Jarrod, we’ve been doing the Android version. So we’ve covered all of our bases. Let’s get back onto how you got started. How did we end up with my app with the Jarrod experience? Jarrod: Well I got started because I had an audience, and I noticed a problem that they had. Being a Phys Ed teacher, it was something that I thought I could solve with an app. I found that you could hire developers and build things for an audience, and I did exactly that. The app was pretty simple. It cost me around about $500 to make, which is this common misconception that when you go down this path, you have to spend an absolute fortune. You certainly can. But the very first one that I did wasn’t of that nature. It was quite simple, and it solved one specific need. It wasn’t trying to do too much. It was just one thing, and that led to more and more, and because I was the only person who’s a Phys Ed teacher who was building apps, it build up this real estate of, if you’re a Phys Ed teacher, that’s where you go to get apps for, basically. So I started to dominate the store and the search terms. James: Right. I’m glad you learned this stuff firsthand because you’ve been helping me do the same. You showed me how to promote my app and to get it ranking really well for a couple of the phrases that are important in my market, and it pops up right there at the top. We were able to drive some activity to the app. You laid out a plan for me. Some of which, we’ll be sharing at the SuperFastBusiness Live event in 2017. You’re going to go into some sort of deeper stuff that you can share with our audience about how they can promote the app, how they can get people to use it, how you can get great feedback from it. That’s been an amazing experience to go through. The other thing that I like about is that you’re an app developer, but you’re not a coder or a programmer. You haven’t had to learn the language of the app. You just need to know where to find the people who do, or the apps that have already been written, which I think is one of the secrets to leveraging. Jarrod: Yeah, for sure. Isn’t it a sort of a good thing as well that you don’t know how to do something. I know you mention that time and time again that when you know how to do something, you end up doing it. James: That’s right. If you don’t know how to do something, you probably won’t be doing it. The two things that I think make this a powerful recipe, one, you’re starting with an existing business. So let’s be clear, we are not saying, hey, go out, start building apps, and be an app gazillionaire. That biz op opportunity was pretty popular a few years ago. I watched that whole thing come and go, and I watched everyone buy courses on it and start building apps and then six months later, they’re on to the next thing, which I think was high-level consulting. And then it went on to something else. We’re not talking about that at all. We’re talking about you, the listener, with your existing business, whatever it is, whether you own a gym, whether you have a website that sells nutrition foods, whether you have an education forum like I do, there will be an app that matches it. I think one of the great examples that you gave, Jarrod, when we were sitting there having a meal in San Diego, there was a bit of a craze out with Pokemon Go, and you had a great idea on how to harness that craze but apply it to your PE teaching audience. Tell us about that one. Jarrod: Yeah, I mean I think you’re right. The real secret here is that there probably are many examples of things like this happening in other markets too, and your market might be entirely new to a tool of that nature. When I saw the whole Pokemon Go craze, the things that appealed to me were very much transferrable to my Phys Ed audience – the hunting and discovery and the activity elements. So I literally got started on building an app called Monsuta Fitness that did the same thing but for Phys Ed. You hunt the monsters down and you battle them with exercise. The thing that gave me a massive advantage was I found a template from a template library that was pretty much the app already done but without the sort of modifications that I would need to make it really appropriate to my audience. So yeah, I moved quick on what was a big trend, but then the secret is I found a template that sort of got me most of the way there. It’s like the Pareto Principle almost, isn’t it? Get most of the way there with the quickest possible path. James: One of the interesting things about the Pokemon Go is that it was a game built on top of another game’s infrastructure. James: They reskinned their other game that came before it, which was not Pokemon-related, but they somehow found a way to leverage existing IP, existing knowledge. It’s a theme that comes up a lot on this particular podcast, that you don’t have to invent the wheel here. There’s people out there selling them. In your case now, what you’ve done, and I’ve certainly been recommending is, you’ve been very good at it yourself, you’ve been good at it with me, and I’ve suggested that you help other business owners who already have a business find the right app that’s probably already been made, and matchmake them, and take them through the process of having it customized to their own business, submit it into the store, put up in the marketplace, seed it with their existing customers, and then start to get it ranked well, and introduce new customers. So we’re at that point now where we have a paid Facebook campaign to encourage subscribers. Through your guidance, I’ve learned how I can find out how many downloads are coming along, I know how to send push notifications, so that when new content is put there, or for any reason whatsoever, we can send out a notification to users, which I think is a huge feature of having an app. James: The other thing is, I got a question very recently, which was, if my website is designed for mobile and it looks great already, what value is an app going to add if it’s just a version of my website and pulling in the podcast and a couple of other social media properties? The first answer that came to mind was, well it’s got its own little icon, and it’s sitting there on the iPhone, and it shows up in most-used devices when people log in. It’s easier for people to separate that out from all the other stuff on their Safari browser, like it’s a captive thing. My icon is like staring me in the face. And as an educator, as the app owner, it’s easier for me to deliver value for my own members because I’m able to use my own community more easily than I was before. So it’s a prominent reminder for the user and for the app owner. Also, you can notify people when there’s something. We’ve hooked up RSS feeds when a blog post gets published, it will let people know via the app if they have accepted the notification. In your case, you had an application where you are visiting different countries, and it gives you that ability to segment down to geographic location. Jarrod: Yeah. I think you’ve just hit the nail on the head of why it’s more powerful. We definitely want people to have a mobile experience that’s really, truly beautiful. But I think there’s something better than that, and that’s the native experience. Just think about your own phone. So as you sit there right now listening to this episode, look at your home screen and just think about how much priority you place on the icons that are on that home screen. I know I put my best stuff on the front screen because I’m always accessing it. Just imagine that your audience are putting your app icon on that front screen as the most accessible thing that they do. To be honest, that’s what I see time and time again. People will contact me, and they’ve got five or six of my apps on the very home screen of their device, and you can bet that that grows the audience and the business and everything that flows with it. And then I think you touched on the other really important part there about push notifications being really quite powerful, especially when they’re personalized, which is sort of the next progression that we could do in an app as well. Personal push notifications for things that they do. James: Right. Firstly, I was a bit surprised at the reaction to my own app. I wasn’t expecting much because of the first, second, and third time I tried it. I thought, OK, so it’s an app, and some people might like this. Jarrod: Yeah. It can be hit or miss. James: I was surprised by the demand of people with Android when clearly, most people who use my community have Apple devices. Android users are pretty vocal. It’s like, when do we get our Android? The other thing is the positive feedback I had from people who are using the app. They are saying, “I’m now using this more than I thought. I was going to cancel, but I’m not going to cancel anymore because I’m finding myself using this a lot.” So increasing usability was a huge factor. I think usability and design is important. I was reading the book Simplify, and it talks about proposition simplifying. It says make your products easier to access, easier to get to, easier to use, more useful. So I combined an innovation, at the same time as the app, I opened up a private coaching section so that members can get private coaching from me that nobody else can see, and that combined with the app has resulted in that 30 percent lift in people using the community. I imagine it’s increased the value derived from the community significantly more than that. In fact, 20 percent more people are getting value. Let’s just be wild here and say it’s most likely that we will get 20 percent lift in retention. I’d say that’s probably going to correlate quite nicely. Whatever the retention was for the people before, if 20 percent more people are using it, probably we’ll be getting a 20 percent lift in our retention. So it’s been a worthwhile exercise, even though upfront, there’s a little bit of work. You’ve got to provide materials, you have to think about what you’re trying to have the app do. There’s definitely some technical hoops to jump through, I know that I’ve been back and forth with you a few times, Jarrod, with questions when I’ve got to get this file or that file, or open this account or that account, use different types of devices and everything down to a QR scanner. There’s some pretty crazy hoops. But it’s kind of like once it’s done, it’s done, until you do an app update. One of the things I like about my app is that a lot of the changes we’ve been able to make, we can kind of cheat because it’s more or less pulling in things from other places. So we can pretty much change the other places to get the same result as if we’ve changed the app. Jarrod: Yeah. I mean that’s a real secret element to it because your ability to stay content, and up, and fresh is going to happen without you needing to submit it, and that’s a real burden. I think a lot of people get turned off. They’re sitting here now, and they may think, where do you even begin with building an app? The reality is, there’s quite a few steps. So finding somehow to bring this to people as quickly as possible has been the goal. It was great to be able to take you through that whole process as quickly as possible, and as hands-free as possible, and see a result like yours sort of come to life. James: The short answer where to begin is go to theappmatch.com. You can just get Jarrod to help you. He’ll go through a whole consultation, he’ll project manage the stuff through him or his team, you’ll get your app launched. So it’ll actually go live. It’ll be a good quality app. He’ll help you come up with ideas because he’s seen a lot of them. He’s developed over 100 himself, and he’s done one for me. I’ve already referred Jarrod to several people, and they’re all having a great experience. So you get lots of good support. Once you launch it, then you actually get the result of all that. So whatever work you put in upfront, you’ll get a result. You can see some of the other apps that Jarrod has put together, on that page. He’s a very creative guy. So I think it’s one way to harness the inherent creativity and prolific entrepreneurial talents of Jarrod is by helping other people go through the process that he’s been going through over and over again. It’s like pretty much, would you say it’s an addiction, Jarrod? Jarrod: Oh without a doubt. As soon as I see a new opportunity, I sort of launch into mode of creation. I have launched profitable and highly-rated apps in less than a week. That mere thought sort of is absurd to most people. You probably couldn’t even get most things developed in that time, but to go from actual idea to being released and highly reviewed in that time period is certainly possible using some of the methodology that we go for, which is finding an audience and making sure you already have some stake in that audience and then finding a template and someone that can get you parts of the way and then releasing it. I think that’s the real reminder is you’ve got to have the audience, because I’ve tried it in places where I didn’t have the audience. I made this app once upon a time called Bug Drop. The audience that I was serving, I didn’t even know it was a game, I built this game. So you’re going against all these game manufacturing entities with millions and millions of dollars in promotion. You can sort of imagine how that went down, it had about three downloads. So find the audience and build a solution for them is the advice. James: Right. Then all these other little bits and pieces that Jarrod knows that I didn’t know. So if you visit SuperFastBusiness.com on a mobile phone, and if it has an app that works on that phone, it’ll show in the top of the screen, and it’ll encourage users to grab the app. How to get the app rated on the store is important. How to introduce it to your members is important or your customers, considering that we’re talking about serving an existing business. But my whole point here is, if we want to put this in a thought bubble, I wasn’t sure if an app was really going to move the needle for me. I’m absolutely convinced that the simple act of having that app has made my products and services easier to consume for my audience, and it’s been a winning move. I’ve been very grateful for the support that I’ve had from Jarrod. Definitely, I’ve encouraged him to make this a product for other people because I want you to experience the same thing that I’ve had. When we’re on this journey, if we’re going to be sitting down and having a consultation with someone to help us bring our idea or marry us up with an existing app for our existing business, what sorts of things are you going to be asking somebody that they could have in mind that they need to know if they’re going to go down this path? Jarrod: Well I mean I think the first play is deciding if they’re wanting to make a really easy consumable for their content. So once I know whether that’s the case or not, then I can go down two paths. So for you, we wanted to make your content much more easier to consume all in one place. So we went after that avenue and we pieced together a content-based app. But some audiences, maybe that’s not the case. They want to make something easier for people to do, basically. So it might be, maybe make it easier for them to order material from their site or create to-do lists. The opportunities here are really endless. I think the first step is to know as much as you can about what they want to achieve. Do they want to present something to their audience in a different way or are they just trying to communicate with them? James: Do they even need to know that? I mean, I was in the gym last week and I was thinking, I have to swipe a little fob to get in the front door. One of those sort of unmanned security camera type deals 24/7. I thought, wouldn’t it be great if they just had a chip reader on every machine, I could just swipe it. Or even better if it just could detect it, and I don’t even have to swipe it, and it just knows which machine I’m working on. And then it showed me a little chart or progress chart of which machines I’ve used, which ones I need to do, like if it went from red to green across my training program, like say I had three-day-a-week training program, and there were six machines I need to use each time, if it could just give me a little progress update as I’m going, while I’m in the gym on my phone app. Maybe the gym owner hasn’t thought of it. But gee, that would get people going back and keep their subscription alive. Jarrod: Absolutely. I mean that same idea of just appetizing anything. Is that even a word, appetize? It is now. James: Definitely. I know it’s closely related cousin to gamify. But appetizing, the process of matching an app to an existing business, that’s what we’re talking about here, and that’s a big idea. Jarrod: I’ll give you another example of someone I’ve helped recently. They’re in the health space, and they’re producing recipes and so on for their audience. It was really easy to find a recipe template that enabled them to put in their recipes and then position that to their audience. It’s almost completed, but they went from having and being quoted $50,000, $60,000 to do something like this, to being able to do that way, way, way cheaper through a service like this and be able to present it much faster. So there’s a million different ways to present an app-based product for your audience. I think the first part is finding out sort of what that audience does, and where they meet, and how they consume things that you do, and maybe what you teach, because your content that you teach could also be app ideas as well. I mean I know you’re big on sleep and things of that nature and productivity. So some other plays for you could be apps that help serve some of those things. I mean maybe in your own audience for the people who are listening, there are things that you teach that you could appetize or turn into apps. James: Yeah absolutely. I’ve got two other huge business ideas/initiatives. They’re on my checklist, like it’s totally on my checklist. It’s on the business checklist that I look for with students, that’s why I’ve been matchmaking you with high level people who already have significant businesses and they don’t even have an app yet, and it just makes sense. I’ve got at least two more that I need to get for the other initiatives. They will do the things like you suggested, they should just start out doing a simple thing, and you can develop them later. But the real difference between trying to figure this out yourself and go and hire an app developer, in house or externally, it’s all the stuff that they don’t tell you that’s the hard bits, which is how to make your site detected, how to get it ranking in the store, how to actually submit the thing, how to update the thing, how do you get changes done. That’s what I’ve liked. You’re kind of like an app concierge, where you just help with the ideas, matchmake a business with an app, preferably there’s one that’s already made. Usually almost always there is, and if there isn’t, it means maybe you’re a bit off the charts with your idea. I thought of several app ideas, and went and looked in the app store, and all of them were there. You might think they’re creative or whatever. For example, one day I went and I bought a dashcam for my car, and I thought, we should just make dashcam for your iPhone, just windscreen mount it, and there’s like dozens of them there. It’s like, I almost felt stupid for thinking there was even a chance that someone hadn’t come up with it. Jarrod: Well, see that’s what I do. I would see that and go, OK cool. So my audience are this. I would grab and find and build the dashcam for this audience. James: Exactly. It’s like if you had a driving instructor customer and they want an app for their business, maybe they could brand it a dashcam that records the student. And then you could submit that footage to the instructor for review or something simple like that. So you could repurpose it. Jarrod: Yeah. I mean look, if you do a search in the app store for animated GIFs, those little pictures that we see all over the internet, there are hundreds of animated GIF players. But my most successful launch recently was an animated GIF app called Loop It. The only thing I did differently was I positioned it and made it the animated GIF recording and playback tool for PE teachers and sent it to my audience. They just went crazy for it, because which one do you pick if you’re a PE teacher? James: Pick the one for PE teachers. James: So it’s a matter again, the crucial thing you’ve got going for here is an existing audience. You combine this with some of the other things we talk about on this show like Ryan Levesque’s ASK survey method. You’re now getting closer to solving customers’ problems. I knew what my customers’ challenges are especially if someone, God forbid, ever leaves my membership, and I ask them why, it’s fascinating to get that sort of survey data and then to solve it. So now, if you just keep removing the reasons why people can’t do business with you or makes it difficult, and if an app is part of that solution, well this is a great podcast for you to be listening to. So Jarrod, what other things would someone need to consider if they’re going to go down this app path? Where is it on the scale of things that are important to do, if they’ve got 20 other things to do, because no doubt, they’re reading a lot of emails, they’re probably part-way through courses, is this an important thing or not? Jarrod: I think it can be. I mean it’s a low-hanging fruit these days. Once upon a time, it used to be really complex. But if you think back to like the 1990’s, wasn’t it really hard and complex to build a website as well? Like it was ridiculous. James: Even in 2006 when I was starting, it was epically difficult, and now it’s unbelievably simple. Jarrod: And the same thing has happened with software development, to a point. You can go and visit websites like Red Foundry and build your own drag and drop. It’s become much easier to do and by that very token, there’s a lot of low-hanging fruit here. I mean, it would be so easy for you to produce an app version that help people get to your store, if you have a physical store, and browse things that they can buy and make it really easily consumable on the home screen of their device or produce an app version that’s like a loyalty program. I think there’s some low-hanging fruit here because of how far we’ve progressed in the digital age and how easy apps are to consume and make and so on. James: Nice. Jarrod, it had been great chatting. My summary of this whole episode is 30 percent more profit is what I’m expecting. 20 to 30 percent, somewhere in that region, from making my app. Basically, making the lives of my consumers easier, and that’s what it’s helped me do. And for the very humble price that it would cost you to get help from a professional like Jarrod, who again, he’s not an app coding business. James: If he was, he’s be charging a lot of money, five, six figures for these things. He’s a PE teacher who turned into a business entrepreneur and is now sharing some of his expertise and skills with insiders and close associates. As far as I know, we’ve kind of really got this whole program up and running, Jarrod, with these customers that are coming through. I was happy to be a case study for this type of business. It’s worked for me. If you have a community or a forum, it would work for you. If you have a health or fitness type business, the ones that I’ve seen will work for you too. Each one is unique to your own business. So I don’t think it’s a case of being crowded or over populated. But for me, it was just final salvation in making it easier for me to stay independent with my OwnTheRacecourse philosophy on having my community away from the very popular Facebook. For many reasons, it’s still a good idea. This made it a reinforcement. So it’s been good. James: Jarrod can help you out too. If you’re interested in getting help from him, we’ll put a link in the show notes as well to his site. Jarrod, thank you so much for coming along and sharing. 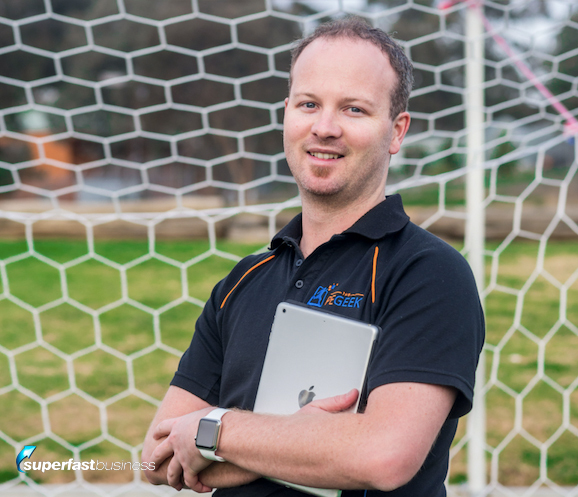 I’m looking forward to the advanced module that we’re going to go through at SuperFastBusiness Live in March 2017 in Manly. Jarrod: Excellent. I look forward to sharing with you.